When Stephen Colbert takes over CBS’ Late Show next year, he joins a grand tradition of innovative comedians hosting talk shows, a tradition that stretches back from Steve Allen and Ernie Kovacs through Johnny Carson and Colbert’s predecessor, David Letterman. But Colbert will also become part of a newer tradition—the modern phenomenon of TV performers succeeding downward. The classic case is Katie Couric. Couric may have been the perfect host of The Today Show, a job she held for 15 years. She was smart enough to do serious news, and she also brought a light touch that made cooking segments and puff pieces fun and fascinating. After conquering the breakfast nook, in 2006 she got a call up to the bigs: the CBS Evening News. There was no question the job offer was a big deal. This was the desk, after all, where Walter Cronkite once sat as the most trusted man in America, and it was Couric’s for the taking. Conan O’Brien found himself in a similar bind when he took over The Tonight Show in 2009. Like the Evening News, Tonight wasn’t the monolith it had been when it had a universally beloved host and next to no competition. It was one show among many. And just like Couric, in making an ostensible move up the ranks, O’Brien left behind the perfect venue for his skills. Conan’s aggressive weirdness played well for the insomniacs and college students watching Late Night With Conan O’Brien at 12:30 a.m. When he tried to adjust his act for Jay Leno’s time slot, he made neither his new or old fans happy. In taking over Late Show, Stephen Colbert is similarly taking a job once held by a TV legend, not to mention moving from basic cable to the No. 1 broadcast network. But in taking that step up, he’s also taking a step down. For the past eight years, The Colbert Report has been like nothing else on television. The Report and Colbert’s on-air persona (which the media has collectively decided to call “Stephen Colbert” in quotation marks) are a specific spoof of right-wing cable news, yet the show’s satire manages to be as all-encompassing as The Simpsons in its heyday. Colbert and his staff take on media, politics, celebrity, and anything else relevant to how we live life in modern-day America. The Late Show With Stephen Colbert will be a good talk show. It may be the best talk show on television. But at best, it will be just another talk show. Colbert has an advantage over Couric and O’Brien in that he’s almost certainly going to be great at his new job. O’Brien once called hosting a talk show a “triathalon of comedy” — you have be good at stand-up, sketch comedy, and interviews, and few people master the entire skill set. Most hosts come from stand-up (Letterman, Leno) or sketch comedy (O’Brien, Fallon) and learn the rest eventually, or not at all. Colbert won’t have to do that. He started out doing sketch work with Second City, and his first two significant TV gigs were sketch shows. He also manages to be one of the best interviewers on television even while locked into his right-wing blowhard persona. Without those constraints, his interviews could get even better, assuming he’s allowed to bring the same mix of authors, scientists, and newsmakers onto his CBS show alongside the usual parade of sitcom actors and pop stars. So Stephen Colbert will most likely be an excellent talk show host. But he won’t be half the host “Stephen Colbert” is. As the host of Report, Colbert did incisive, riotously funny satire that somehow lost none of its bite after eight years on the air. As the host of Late Show, no matter how much energy, wit, and intelligence he brings to the job, he’s still going to spend half the night talking to Kate Hudson about her new romantic comedy. Worse yet, it’s not clear he’s going to reach a bigger audience. While Letterman has had better ratings than Colbert overall, The Colbert Report has routinely beaten Late Show in the under-50 demographic for the past few years. “Stephen Colbert” is unique in the television landscape, maybe in television history (as Comedy Central is sure to find out when the network tries to replace Report next year). But no matter how well Stephen Colbert does at Late Night, in the end, he’s just another Jimmy in an increasingly crowded field. Hosting Late Show isn’t what made David Letterman a revered figure in comedy, and it won’t be for Colbert. Letterman became a legend by reinventing the form as the original host of NBC’s Late Night. That show mocked the idea of talk shows, of television, of the very concept of entertainment. Dave may have been coasting for the past decade (at least), but he was coasting on years of groundbreaking comedy. 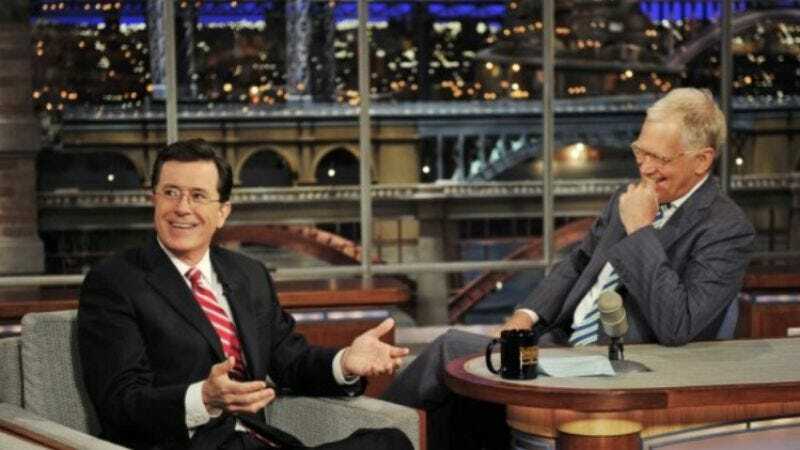 Colbert’s dilemma is that he didn’t become a true successor to David Letterman by taking over Letterman’s job. He did so by hosting Report and, like Dave before him, reinventing what a television show could do. Now, again like Letterman before him, he’s moving to CBS and the second, less interesting phase of his career. Colbert has made it to the top. He just had to take a step down to get there.